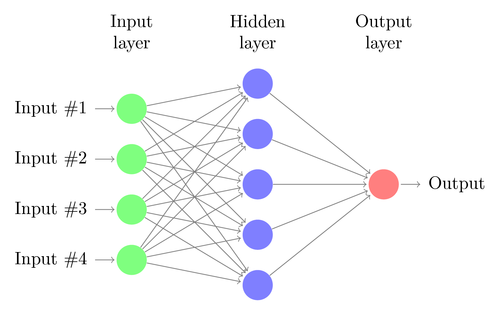 In our previous post Implementation of Perceptron Algorithm using Python we learned about Single-layer Perceptron, which is the first step towards learning Neural Network. It is a model inspired by brain, it follows the concept of neurons present in our brain. Several inputs are being sent to a neuron along with some weights, then for a corresponding value neuron fires depending upon the threshold being set in that neuron. For understanding the theory of Perceptron please go through our article on The Perceptron: A theoretical approach. Now, what is the need of Multi-layer Perceptron! To solve more complex problems or to make our machine learn more complex stuff like human faces in an image is a very complex stuff for a machine. Thus we require multiple layers in our Neural Network to solve problem more efficiently. We will use only 2 layers in this algorithm. It generates random weights for both first layer and hidden layer. Since we don’t the output of first layer, which will be input for our second layer (hidden layer), we uses Sigmoid function for normalising the values, that is, for any value the result will lie between 0 and 1. Since we don’t know in which direction the weight should move Positive (+) or Negative (-), to resolve this problem we use Sigmoid derivative, which tells us whether it is moving away from local minima or towards it, thus by using that we decide what to change in weights. For faster and better learning of a Neural Network, especially when we have less data, we shuffle the position of input with respect to outputs for each iteration or epoch. # Train the neural network using the training set. # Do it 999 times and make small adjustments each time. Hence we got the right result corresponding to Input vector that we have supplied. Above post gave us an insight that how we can create multiple layers in a Neural Network and how it does the learning. In our next post we will learn about Multiple other activation functions like tan(h) with their uses in Neural Network.